Varidesk has long been seen in the competitive world of standing desks and standing desk accessories as one of the heavyweights. They boast an incredible range of products like standing desk converters, height adjustable desks, standing desk mats, monitor arms, and chairs. Ergonomically speaking, the Varidesk products will be sure to sit you (or stand you) in the right position and posture which will benefit your health and productivity. So, what makes the Varidesk products so good? Well, that’s what we’re here to find out. In this article, we have set out to dig deep and forage through piles of information, to bring you a comprehensive review of the best Varidesk products. This will be a LONG list of products, and for each one, we have found the good and the bad, and if we believe it really is better than the Varidesk alternatives on the market. If you are thinking of buying a Varidesk product, make sure to see how it stands up (excuse the pun!) to our in-depth research. DO NOT MISS: We have also compiled a list of 8 Varidesk alternatives that we think are better, cheaper, or a combination of the two! Firstly, let us start by saying if you’ve seen our other posts, we believe what truly makes a great standing desk is its adjustability. In saying that, non-adjustable standing desks do sometimes have their place in the office, and having a non-adjustable standing desk is probably better than a seated desk overall. Varidesk has three desks of interest in their non-adjustable range, each serving a different purpose. These desks are great overall for communal work and shared office spaces. This standing desk is more of a co-working bench space. It comes with two layers, an upper workbench, and a lower storage platform. It can fit up to 8 people working at the same time and is great for conferences and group work. This table has a huge working surface are, in fact, it measures 42 x 72 inches. Not only that it has a secondary platform where you can rest your feet or use a storage. This monster of a standing table is fantastic for group work and can accommodate up to 8 people according to Varidesk. Despite its size, the QuickPro Conference is easily assembled and can be put together in a matter of minutes. It also has 4-inch wheels for easy transportation. Lock the wheels when you’re working, then unlock them to move the table to a new spot. Due to its size and quality build material, including a thick butcher-block style working surface, the QuickPro Conference can hold up to 300 lbs! Lastly, we love the fact that Varidesk have included a small hole in the middle of the desk for cable management. This hole is mirrored in the bottom platform as well so you can slide the cables hidden under the desk. We’ve already mentioned that lack of adjustability is a huge negative for us, but it will just be repetitive if we keep saying that about each of these non-adjustable standing desks. Rather, let’s look at other problems we see with the QuickPro Conference. Firstly, the desk is 42 inches tall. Now if you’ve seen our article on the best standing desks for tall people, you’ll know that there are some desks that can reach over 50 inches. Most likely using this desk as a taller person will force you to slouch, or you would just use it with a stool as pictured. Another issue we see is that with a large conference table, there is no real possibility to attach a monitor arm. Unless you could somehow connect the grommeted clamp to the hole in the center, there are no other options to have an adjustable monitor arm. Despite size being a positive feature, making the table robust and sturdy, it also is a negative feature. A table this large has a large footprint and occupies a ton of space in the office. For what this table is, simply a large conference table, then it does the job well. It is well built and Varidesk is confident that the frame and desktop are of the highest quality materials. We love the fact that it is designed as a standing desk, however, the lack of adjustability does hold it back. Lastly, it has a pretty hefty price tag. This makes sense when you consider the materials and design quality, but for a similar functioning product, we’re sure there are cheaper substitutes out there. The QuickPro meeting table is another one in the non-adjustable standing desk series, somewhat of a smaller brother to the larger conference table. This table is designed for smaller meetings and co-working, but also has a modular design which allows you to make it as big as you want. Even though we’ve classed this standing desk as non-adjustable, it actually has 3 different height settings. This is fantastic as it allows at least some level of adjustment. It also is much small and lighter, which is a plus if you plan on moving it around the office a lot. It doesn’t, however, have wheels like the conference table, instead, it sits on 4 screw-adjustable feet. The beauty of the desk though is its modular design. Varidesk recommends setting up a couple next to each other to get the benefits of a larger desk. It, like the QuickPro Conference, has cable management hole in the center of the table to help you keep cables hidden away. Despite the 3 height settings, the table still lacks adjustability. It would be easier with this desk to set up monitor arms (although you would lose space for group working), that would give you better ergonomics. Also, as with standing desk converters with an x-frame, this desk has a few pinch points. Rather than straight legs, the QuickPro meeting table has an x-frame where the legs cross and pinch when adjusting between height settings. Once again, for a simple meeting table then the QuickPro is well-built, well designed and most importantly stable. 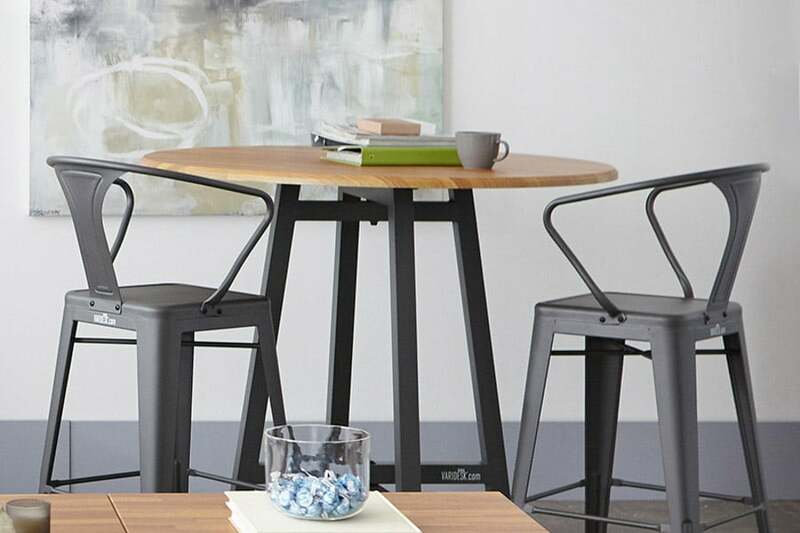 We love that they have even included some different height settings (although we still consider it a non-adjustable table), and best of all in our opinion is being able to put them together, giving you a bit more freedom than just one large conference table. The QuickPro is much more reasonably priced we believe, and in fact, you could buy three for the price of one conference table. Do watch out for small problems like pinch points, but other than that there is almost nothing to worry about. The QuickPro Roundtop is once again a simple solution for smaller offices and workspaces that want a standing desk for co-working. It has all the best qualities of the Varidesk brand, strong build, sleek design, and stable tabletop. This product is relatively lightweight for a shared standing desk, so pretty easy to move around the office. It also can be assembled in minutes, absolutely no fuss. To be completely frank, we don’t see why you would select the roundtop over the meeting table other than for design purposes. In our opinion, they are both very similar, but the meeting table just does everything a little bit better. The Roundtop lacks features like cable management, adjustable range, and modular design. Also, because it is circular, you still take up quite a lot of space but you give up a fair amount of tabletop working area. So you might think a 2/5 rating is pretty harsh! Well, the rating doesn’t reflect on the product in and of itself, more on its comparison to the QuickPro Meeting table. The Roundtop is still a perfectly well-built table and if you like the circular style then we can still recommend this product for its build-quality and stability. However, the fact that it is missing the 3 adjustable levels, the modular design, and the center cable management hole for us make this product much worse than its square counterpart. 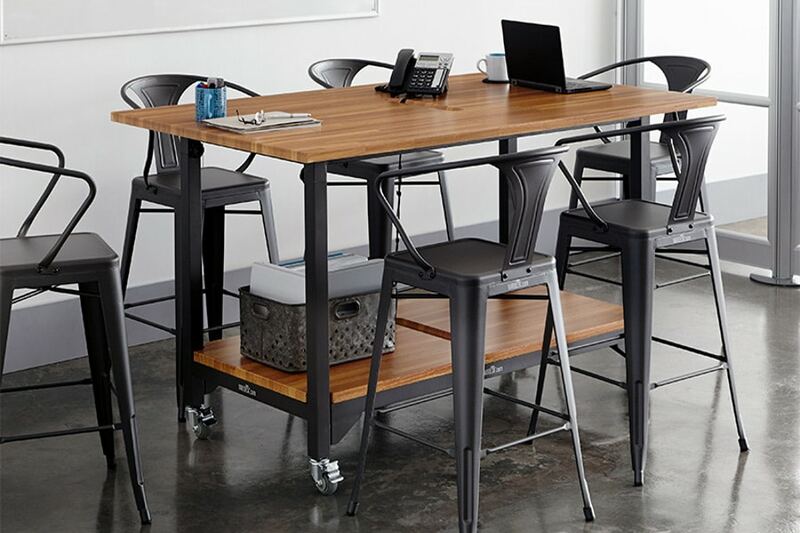 In the height adjustable full-size tables, Varidesk has one manual option and one electric option. Both are very affordable given their fantastic build and the high-quality materials used. 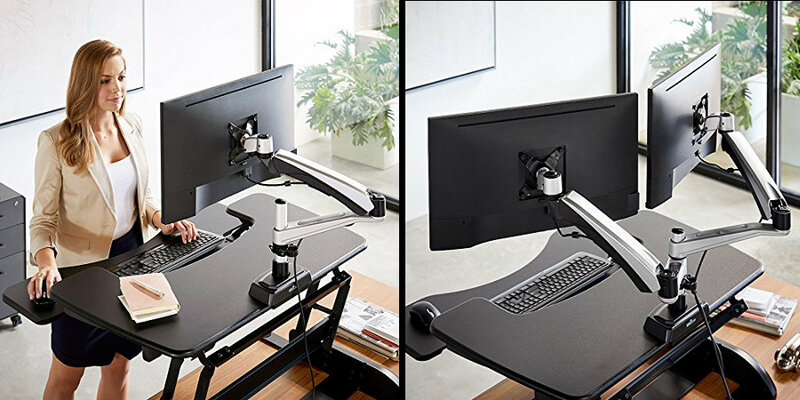 Height adjustable desks are generally much larger, heavier, and therefore more expensive than standing desk converters, so the fact that both these desks are sub $1000 makes them a real bargain in our opinion. Height adjustable desks like the Varidesk Prodesk series are a great choice for people who need more room on their desks for extra monitors, and who don’t lack space in their office. The Varidesk ProDesk 60 Electric is a full size sit to stand height adjustable standing desk. It is a large, strong, and versatile standing desk that is great for people looking for a full replacement of their current desk, rather than a desk converter. There is A LOT to like about this desk, but we’ll try to keep it short and sweet. One of the main complaints of standing desks, in general, is their lack of stability at full extension. The ProDesk 60 gets this right with its solid steel frame and an enhanced steel crossbar for added stability. Not only is it extremely stable at all height settings, but it can support up to 250lbs on its tabletop. It also has an incredible range, from 25.5 inches to 50.5 inches, a HUGE 25-inch range. In fact, this range puts it in contention for one of the tallest standing desks in the market. It has infinite height adjustment, which means that there are no set heights, you can adjust it to the exact millimeter of your liking. You can also program your favorite settings with 3 pre-set heights in the control panel. This is perfect for people who move from sit to stand frequently, or for those who share a desk with others. This product will also be up and ready in minutes, which is unusual for such a large and complex model. Other full standing desks require assembly, but if you’re concerned about doing something wrong then maybe this is the product for you. Lastly, we love the details of this product. There is a cable management tray, a beveled cutout at the back (if your desk is flush against a wall you can still run your cables behind), and a quiet yet powerful motor that won’t be a disturbance when it moves the table up and down. We like to be thorough and quite picky when it comes to reviewing products, but even still it was hard to find issues with the ProDesk 60. The main issues we saw were the need for a monitor arm and the large footprint of the desk. Some standing desks offer a keyboard tray which means your monitor and your wrist/keyboard height can be adjusted separately. The ProDesk 60 doesn’t. It is just a solid tabletop which means if you want the correct ergonomic posture, you’ll have to get yourself an adjustable monitor arm. Also, the ProDesk 60 is only available as a 60-inch x 30-inch desk. This is pretty large and takes up a lot of room in the office. We like certain products like the Jarvis by Fully that give you a few different size options to suit your needs. This has to be one of the best standing desks we’ve reviewed so far. It really has everything that we like in a desk, and only misses a few small details. Among its competitors it definitely holds its own, being just as good as other well-known brands like the Jarvis. One thing to note is the price. Varidesk ProDesk 60 Electric comes with absolutely everything included, so even though at face-value other products may seem cheaper, once you add things like a display console, cable tray, and different sizes, the prices start to look similar. In the world of height adjustable desks, the Varidesk ProDesk 60 definitely stands out because of its unique design. 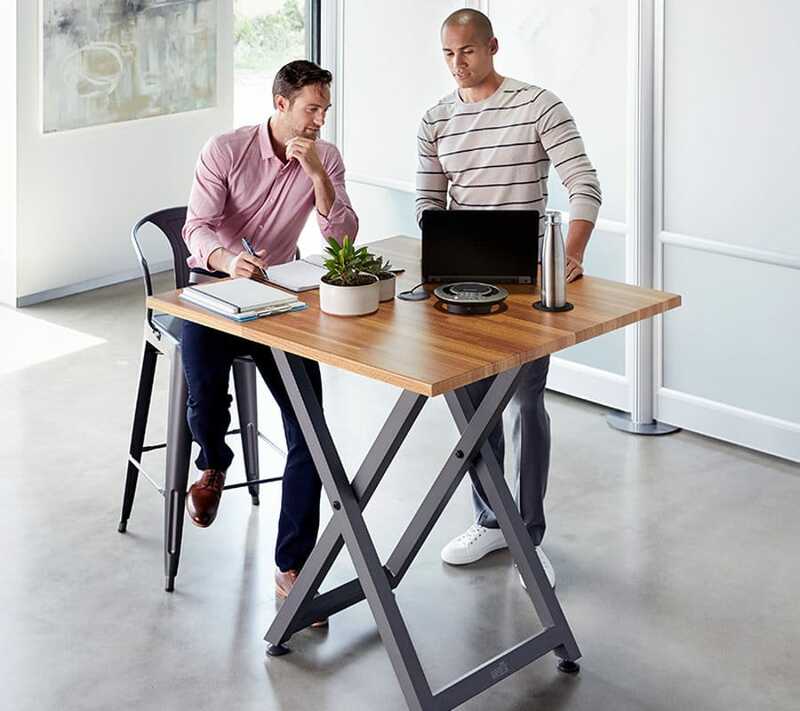 It looks more like a standing desk converter on stilts than a standard sit to stand desk, but don’t let appearances fool you, this product deserves all the praise it gets. The ProDesk 60 is a mechanical height adjustable desk, it uses a spring and air-lift piston to help you move it up and down. To make this movement as easy as possible, Varidesk has designed the desk with two cutout handles in the desktop. This clever design and powerful mechanics means that lifting the table (even fully loaded) is a breeze. The 9 different levels give you plenty of options for height settings, and this desk should be enough for most average height people. Not quite as impressive as the infinite positions of the electric version, but not too bad. A major benefit is that this desk is offered in two sizes, 60 inches like its electric counterpart, or a 48 inch model for people with confined working areas. If you work in a cubicle setting, this desk is more adaptable to your needs. Cable management trays keep the cords away from the moving parts (a z-frame design), and the desk can easily hold two monitors (although make sure that you don’t go over the 50 lbs capacity). A lot of the reviews say the same thing over and over, “the desk is almost perfect, but it’s missing a keyboard tray.” As we pointed out with the electric version, a keyboard tray is often missing on height adjustable desks, and the ProDesk 60 is no exception. Occasionally people mention the use of very heavy materials as a problem, especially if you need to move the desk often. In our view, this is a trade-off with stability, so you need to figure out which is more important to you. Our biggest issue with the ProDesk is its dynamic range of 18 inches. It has a max height of almost 48 inches and a minimum height of 30 inches. This, in our opinion, is sub-par and doesn’t offer nearly the same adjustability as the 25-inch dynamic range of the ProDesk 60 Electric. We can’t quite rank this as high as the electric height adjustable desk, but it almost gets there. It has additional features like a smaller version available which we think is great but has less adjustability and range for which we had to deduct a few points. If you’re a fan of mechanical height adjustable desks, then the ProDesk is a brilliant product. It will also save you money compared to the electric version, even though we think both are reasonably priced sub $1000. Despite a smaller frame, it holds up in terms of stability and will even hold two monitors and more. Straight out of the gate let us just say: if you are using a standing desk, it’s better not to use a laptop. Well, ergonomically it will never be your best solution. the laptop screen and your hands are very close together, so you’ll always be looking down (this is true for sitting or standing with a laptop). We recommend you have a look at our guide to monitor arms and consider buying a monitor for your laptop instead. Ok, so what is the Laptop 30? The Laptop 30 is a solution for those who want to stand but don’t need a full standing desk. It is a desk converter that sits on your workstation and can be adjusted to a range of heights. Despite its small size, the Laptop 30 still has 9 height settings, giving you as much freedom of movement as larger standing desks. It has a max height of 15 inches, which on top of a regular table will provide the average person enough height to stand. Of all standing desk converters on the market, this is probably the most compact and lightweight that exists. Many people travel a lot for work, and finally, there is a viable option for maintaining your standing lifestyle while on the road. With a footprint of 30 inches x 12 inches, this desk converter is great for tight spaces and small cubicles. If you have steered clear of other larger desk converters because they take up too much room, then its worth giving the Laptop 30 a look. Due to the product’s lightweight nature (which is a huge plus for portability), it suffers in that it can only hold laptops up to 15 lbs. Now this is pretty heavy and there aren’t many laptops out there this big, but if you want to put a book or two on the desk converter too, you’ll have to watch out. It’s also not the tallest desk converter out there. 15 inches, while good for some, will not be tall enough even for users around 6 feet tall. It will probably cause more issues than sitting if you have to crane your neck to stare down at your screen. Lastly, there have been complaints about the product being a bit fiddly. When the Laptop 30 is down, it sits flush on the table. To lift it you must pull up tabs on either side, which are quite close to the table surface. It can be a bit tricky to get your hands in there to lift it up. In fairness, fiddliness is to be expected with a very compact product. Well, despite what we said earlier about standing desks and laptops, this product really is pretty great. You can’t compare this to other desk converters, as it is only for laptop use, it’s really comparing apples and oranges. For its intended use, this product is one of the best on the market. Stable, well-built, and not an eye-sore like some other products. This biggest success of the Laptop 30 is its compact and lightweight design. While down, it only adds a couple of inches to your desk, and in terms of portability, you can’t beat it. Th Varidesk Pro 36 is the first in the range of what we consider true standing desk converters. It employs a classic z-frame lifting method to give 11 different height settings. Users like it for its simplicity and ease of use, as well as its sturdy and stable build. 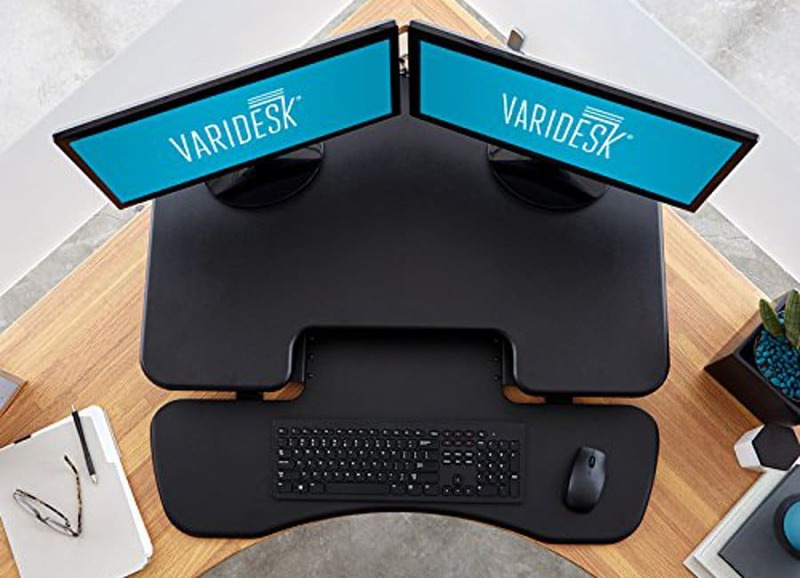 In our opinion, where Varidesk really sets itself apart from other brands is by offering many sizes of the same product. Many people want to use standing desks but often are restricted by their office space. The Varidesk Pro 36 is also available as the Pro 30 (a 30-inch model). Both these models have a maximum height setting of 15.5 inches and a minimum of 5 inches. At its lowest setting, the Pro 36 has a small keyboard tray which slides out from under the unit where you can place your keyboard and mouse. This tray doesn’t rise with the desk, however, and only is useful at the bottom setting. The best part of the desk is its speed and ease of lifting. It can hold up to 35 lbs and move from its lowest to the highest setting in around 3 seconds. If you’re doing this a lot each day then those precious seconds add up! Unfortunately, there’s quite a lot we don’t like about this product. Firstly, the top platform is just a single level with no keyboard tray. This leads to poor ergonomic positions when you need to type and use a mouse. If you put the keyboard at the right height, you’ll be looking down at your monitor. If you adjust the monitor, your hands will be far too high to type comfortably. Secondly, the adjustable range of this desk converter is only 10 inches, which is much less than you would hope for with a quality product. Given that it will add 5 inches to your desk at the lowest setting, this will most likely make your seated work uncomfortable. It doesn’t compensate this with great standing height, however, as some users of 5’8″ have even said it’s too short for them. Finally, the value for money isn’t great. The far superior Pro Plus 36 is actually the same price, so if you like the Varidesk brand we recommend you look more closely at that one. There are also many other comparable products that are cheaper than the Pro 36, so overall it’s too expensive for what you get. 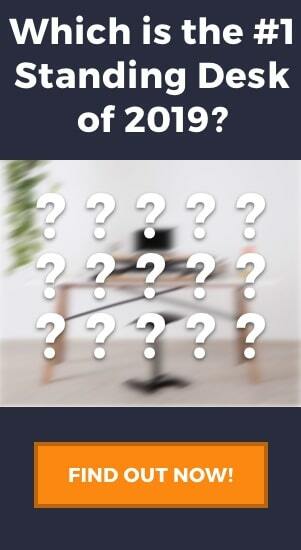 Well, sorry Varidesk, you can’t win them all! 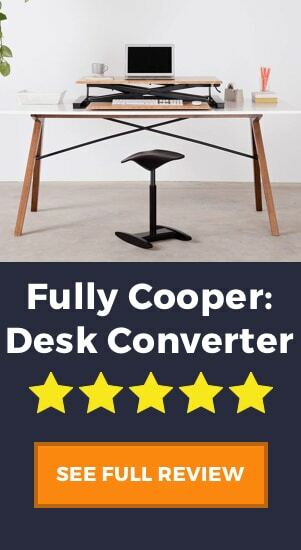 We really don’t recommend this product to our readers and don’t think that you should consider buying it if you are looking for a standing desk converter. The product overall has too many ergonomic issues and not enough benefits to make it a worthwhile purchase. The fact is there are much better options out there for similar (if not cheaper) prices, so we don’t think you would be getting full economic or ergonomic benefit from this product. Have a look at the (in our opinion) far superior Pro Plus 36. The Varidesk allows you to switch between a sitting or standing desk with ease. The Varidesk Pro Plus 36 was the first standing desk converter that we reviewed. We liked it then, and we still like it now. Its a number one bestseller on Amazon and we believe that it truly deserves this spot. The Pro Plus 36 comes in 3 different models, 30, 36 and 48 inches. It is the most popular product on Amazon and has a host of raving reviews. The first thing to point out is that the Pro Plus 36, unlike the Pro 36, has a separate keyboard tray which places your hands lower than the monitor platform. This is much more concurrent with ergonomic design and better for your wrist health. It also reaches 17.5 inches at its highest, a full 2.5 inches higher than the Pro 36, much more user-friendly for taller people. It has a weighted base which makes it sturdier than other standing desk converters, so even at this full height setting, it will have minimal shaking. The smaller unit is designed for only one monitor, but the larger two are designed for dual-monitor setups. The largest model can even hold up to 45 lbs on its desktop. Our biggest gripe with this product, and one reason it will not get 5-stars, is the z-frame design. A z-frame design affects the way it lifts from the lowest to the highest setting, and while an x-frame will move vertically, the Pro Plus 36 will move out towards the user. At full extension, the desk converter will be an extra foot out from the desk, taking up a lot of room. Despite the weighted base, there is an issue that is found with almost all manual standing desk converters, is that it is hard to move them in a controlled manner. For this reason, if you have very expensive or fragile items on your desk, and stability is of utmost importance, then an electric standing desk converter may be a better choice. At the same price as the Pro 36, the Pro Plus 36 is the much better option in our opinion. The added ergonomic benefit of having a keyboard tray, the added sie variations for you to choose from, the overall build and stability of the desk converter, it’s hard not to like it. Remember that it is a manual desk converter, so if you have troubles lifting heavy objects or need extra stability, then we recommend comparing this product first to the next product on our list. The Varidesk Pro Plus 36 Electric, although sharing a name with the previously reviewed product, has many differences. The obvious one being the fact it is electric! It has a small switch in the front with a small display that has numbers between 0 and 100, indicating the height level. It also has a better lifting mechanism which is much more practical for use in limited spaces. As we mentioned in our introduction of the Pro Plus Electric, it has a different lifting mechanism to the mechanical version. The Mechanical version has the z-frame lifting movement, meaning it will lift upwards and outwards towards the user. The Pro Plus Electric not only has a smooth electric lifting mechanism, but also an x-frame design that will lift more vertically and not as much towards the user. In our opinion, this is great for stability and a better use of office space. Varidesk also includes a power hub which can be clamped to the desk and plugged in at the back. If your desk is connected to the mains, then you can connect the power hub to your desk and then connect up to 5 devices to the hub (it has 3 plugs and 2 USB ports). The Pro Plus 36 Electric also beats its manual counterpart with the additional 1.5 inches of range. This desk converter can reach a height of 18.75 inches, so although not as tall as some of the tallest standing desks on the market, it covers a good range for most standing desk users. Lastly, the weighted bottom makes it very sturdy on top of your desk, and stability is essential at full height. Unlike many Varidesk standing desks, the electric version only comes in one size, 36 inches wide. Although 36 inches is a fairly common size for standing desks and what some would consider a standard width, people who require smaller or larger desk converters will have to look to the manual version. Additionally, it comes with a bigger price tag. 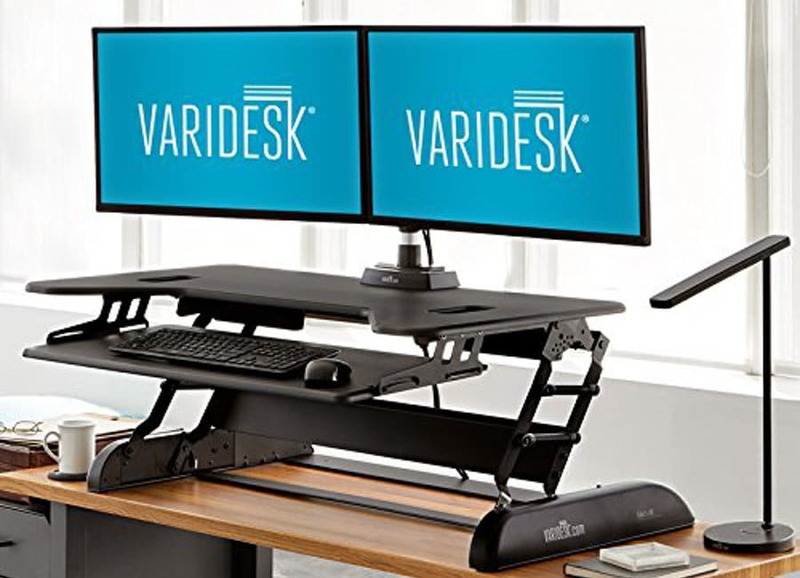 This is to be expected as it is generally more expensive an electric standing desk as opposed to a manual one, however, the Varidesk is around $100 more expensive for the electric. It’s worth noting that the power hub itself is worth $45, so the true value of the desk is only $55 more. There is no real option to remove the keyboard tray which may be an issue for some. It is fixed in place, however, Varidesk has made it pretty large (the outer section is 36″ x 7.5″, the inner section is 20″ x 4.25″) and also added keyboard cable management to make up for this. We mentioned the weight as a factor for sturdiness, however, it does make it quite a bulky item. If you want to use your desk AS WELL as a standing converter, then the Pro Plus 36 Electric may be too large. We can’t say that it is better or worse than the manual version, but it certainly is a great product. We think they both have their uses and it comes down to personal preference. Don’t be fooled by an electric standing desk, however, because this one is known to be pretty silent, so you won’t bother your workmates if you were worried about using a motor. On top of that, it has that additional inch of height which may make it a winner for some people over the Pro Plus 36. Many people these days still work in office cubicles, for better or worse. 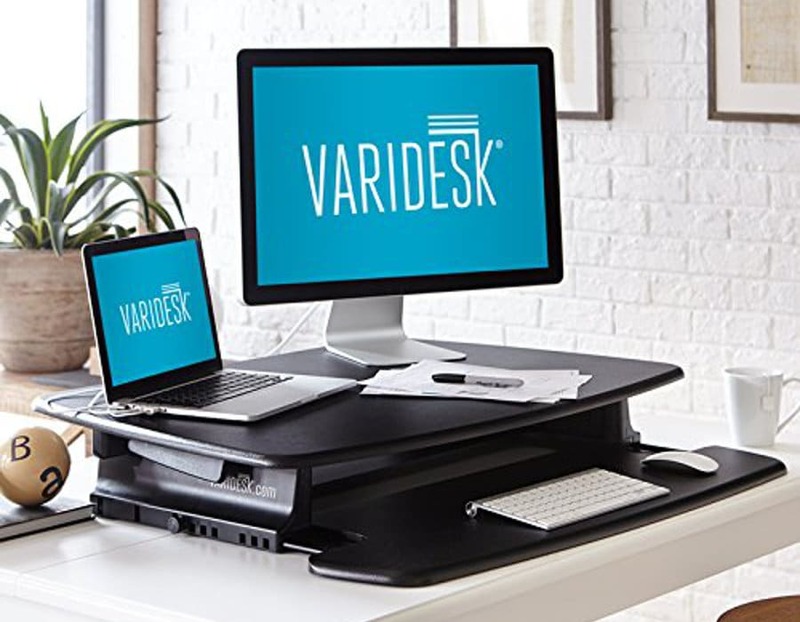 Unfortunately in an office cubicle space can be limited, so Varidesk has created two cubicle standing desk converters to specifically fix this issue. The first of the Varidesk Cubicle Series is the Cube Corner 36. As the name suggests, it is a corner standing desk. Don’t let the idea of a cubicle standing desk fool you though, these products are still plenty large for the average person. In terms of corner desks, you are generally pretty limited in your options. There are a few other products out there, but not quite as good, in our opinion, as the Cube Corner 36. It has a clever design so that it perfectly fits in the 90-degree angle of your corner desk, but leaves enough space behind to control all your cables. We really like the contoured keyboard tray too, which will match the contour of a curved corner desk (as seen in the image above). Despite its purpose, that is to fit in a small cubicle, the Cube Corner 36 is actually big enough for 2 monitors, and the monitor surface will still have plenty more room for additional items. This is true for both the 36″ model and the 48″ model. The Cube Corner has a 35 lbs capacity, but with its two handle holes and gas lifting mechanism, it lifts very easily. This is the same design as the other Varidesk manual lifting converters. Once again, as with other Varidesk products, we don’t like the fact that they insist on using a z-frame lifting mechanism. The idea of this desk is to be smaller in order to use in a cubicle, but if the z-frame lifts out towards the user, then space becomes an issue. 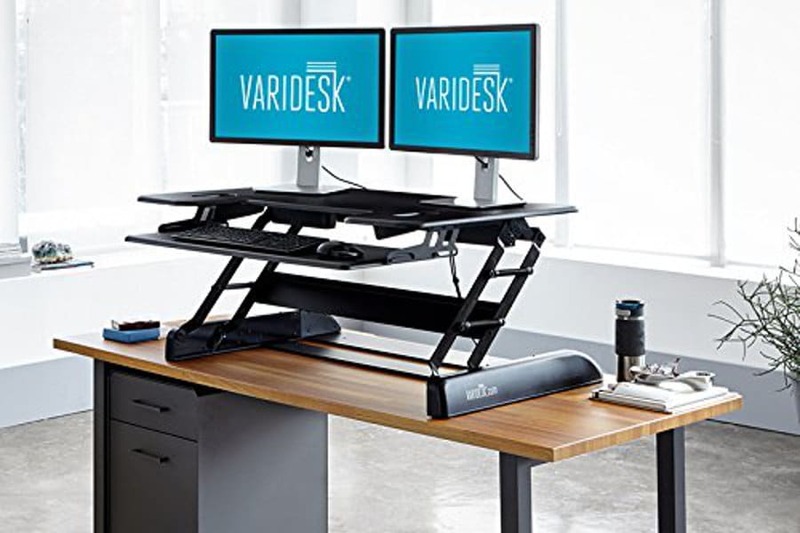 We would much prefer to see an x-frame on this product, and hopefully, Varidesk makes some of these changes in the future. Some people have found the keyboard tray to be too small, possibly due to the contoured front edge. It seems that having a regular size keyboard and mouse should fit fine, but if you use an ergonomic keyboard or mouse, which are generally larger, it may not fit in the space. For its designed purpose, the Cube Corner 36 is a pretty special product. It allows people in tighter cubicle spaces to get the most from a sit-to-stand adjustable desk riser. It has many similar qualities to the other Varidesk standing desks, good build, stable, solid materials, and easy lifting mechanism. It also has the unfortunate lifting trajectory, protruding out from the desk. If you have ample space this may not concern you, but we believe that in a cubicle space is generally an issue, so they would have to address this issue for us to give a better final score. The Cube Plus 40 is the second of the two cubicle specific standing desk converters. Unlike the Cube Corner 36, this product is not designed for the corner of a cubicle but instead is designed to sit on narrower desks. Varidesk has created a wide desk with a footprint that is not as deep to allow for use in tighter spaces. The Pro Plus 36 (standard footprint) is 36″ x 29.75″ when down. At full extension, it’s full depth goes to 41.75″. The Cube Plus 40 has, in fact, 2 models: the 40 inch and the 48 inch. The Cube Plus 40 is 40″ x 21.5″ when down. At full extension, the depth is 35″. The Cube Plus 48 is 48″ x 23.75″ when down. At full extension, the depth is 33″. This thinner design makes the unit a better fit for smaller spaces, adding ample space width-wise and reducing the depth footprint. One thing to note is the fact that the 40-inch model is 2 inches longer than the 48-inch when fully extended. We don’t see this as an issue, however, since the extra two inches is from the semi-adjustable keyboard tray. Now it can’t tilt, pan, and adjust perfectly, but it does slide in and out which is a nice additional feature. There are complaints that arise from the keyboard tray and the fact that it is too small for a keyboard and mouse to move efficiently. This issue stems from a design flaw in the lifting mechanism. Essentially, the two holes to lift the unit sit are directly above the keyboard tray and the levers that you need to pull to adjust it sits between the tray and the monitor platform. If your keyboard is big or you need to use your mouse a lot, its likely that you will be knocking into these levers. With the semi-adjustable keyboard surface this is less likely to happen, and more of a concern for the 48-inch model. The Cube Plus also suffers the same issue as all other z-frame standing desks, albeit to a much lesser degree, that it stands an additional 10 – 13 inches from your seated position. Once again, for a cubicle with limited space, this may be a factor. This product from Varidesk has a mix of positive and negative reviews. The majority of the reviews (over 93% of people gave at least 4/5 stars on Amazon) makes us realize that the good outweighs the bad. We have to admit though, that this design flaw is an issue for us. Having the levers directly above the keyboard tray make is much more difficult to use, and not an ergonomic design. For this reason, we deducted a few points. 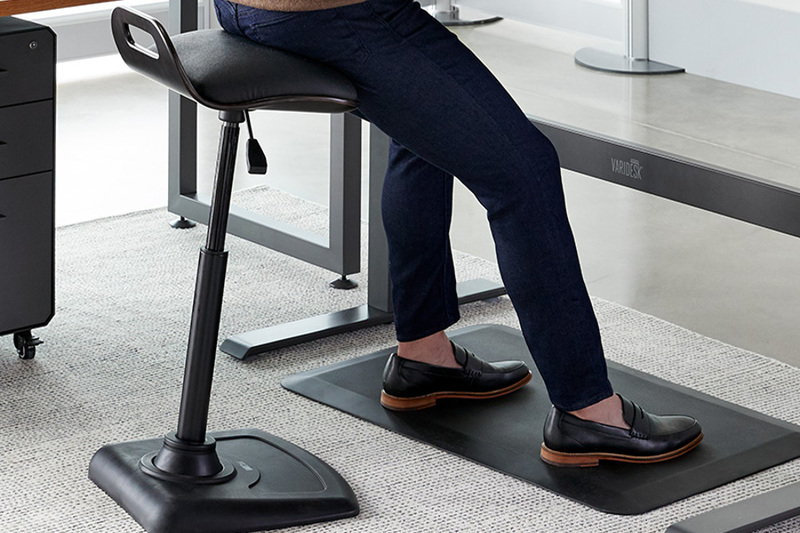 As the name suggests, the Exec 40 is an executive standing desk converter. It is big, tall, and solid. It is the tallest of all the Varidesk standing desks and has enough surface space to fit even the busiest desktops. The main purpose of the Exec 40 is to be a tall standing desk, which it certainly is. At 23″ it is one of the tallest standing desks on the market. If you have read our height guide for standing desks, you’ll know that a desk this size would be suitable almost everyone. Despite its height, Varidesk has still managed to make the desk sturdy and stable, mainly due to its large footprint. Sturdiness in taller standing desk converters is often an issue so the fact that the Exec 40 manages to be stable at full extension is a big plus. The Exec 40 has one of the worst cases of forward movement of any standing desk converter that we have reviewed. The forward movement from compacted to full extension is almost 18 inches. Now, we must point out the this isn’t a flaw or an issue, merely something to consider in terms of space. We imagine, however, if you are looking at the Exec 40 you have some space to work with. Due to its size, it is also very heavy, weighing in at 96.4 lbs. This, in our opinion, makes it less user-friendly and definitely less transportable. If you’re not planning on moving the desk converter once you install it then there is no real issue, but part of the beauty of a standing desk converter is its transportability which the unit lacks. The last major issue is one we addressed with the previous model too, a lack of keyboard space. The lifting handles are once again above the keyboard tray which limits hand space. Overall it is not a bad desk converter. It is very big and tall, which brings both good and bad. The good is that it is sturdy and stable, the bad is that it has a very large footprint and is very heavy. We believe you’d be very happy with the Exec 40, although if you are looking for a tall standing desk then there are products on the market which are just as good, if not better, and most likely cheaper. In the end its the Exec 40’s price tag that doesn’t convince us, because for this price we’d expect more. Standing desk mats, otherwise known as anti-fatigue mats, offer added cushion and support for your hips, knees, feet, and back. If you want to stop sitting all day and start standing, don’t go creating new issues for yourself by not including a standing mat in your setup. Varidesk has 2 series of mat, the first is the basic anti-fatigue standing mat. Cheaper, more basic, non-active design. The second series is the active series, designed to not only provide all the anti-fatigue properties of the standard mat but to also provide different ways of keeping your legs and feet active. The first anti-fatigue mat from Varidesk is a simple and effective product. When standing for long periods of time you can begin to create other issues on your joints. An anti-fatigue mat such as this combats that by adding a soft cushion layer beneath your feet. 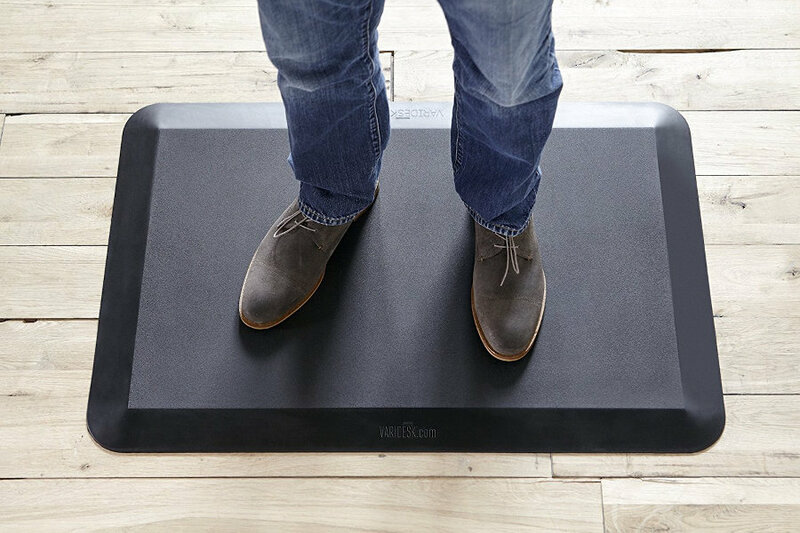 For a simple design, the Varidesk Mat perfectly adequate for adding a bit of comfort while you stand. It uses a non-slip material on the underside to keep the mat in place, but it is still easy to move when you want to move back to a seated position. The beveled edges are a must and make sure it is safer. You won’t have to worry about catching your toe or scuffing up the edges, they will always be flat. At its thickest point, it is just over half an inch thick, providing a decent amount of support with its durable and dense core material. It doesn’t have any bad scent like other standing mats can have, and it is easy to clean. Just use a damp cloth to wipe it down every so often. For heavier users, be aware that the mat may not have the required give and cushion to make it a comfortable choice. There are other products which are said to be more cushioning, and if this is something that you require then the Varidesk mat may fall short. The biggest drawback, however, is the price. At $50 – $60 (depending on size), the mat is not a luxury item, but you can certainly find cheaper which achieve the same job. We like the Varidesk mat. It is simple yet effective, adds cushion under your feet to stop you getting sore during the day. In terms of its functionality, there isn’t too much to fault, apart from a slight lack of cushion for heavier users. As we said, the main drawback is the price, so if you want to find a cheaper product you definitely can. You can trust the quality of materials used by Varidesk, but this is not to say that a cheaper product would be inferior. Here’s where things get a little more interesting! As opposed to flat standing mats, there is another style which is the ActiveMat. The active mat is bordered with a ridge which allows you to flex and stretch and activate your leg muscles while standing. We love the idea of a more active working environment, so this mat immediately gets our attention. As we mentioned before, having a ridge allows you to stretch your feet and lower legs while standing. The ridge is 3.25 inches tall, as opposed to the 0.75-inch center. This allows you to get a good Achilles and calf stretch just by propping your toes up on the edge. What we love most is the fact that it is more of an optional active mat. There are other products which in a way force you to be in an active position, however, the ActiveMat is wide enough to give you the freedom to statically stand or actively stand as you please. For this style of mat, people have complained about the width. This is for two reasons, the first being that it may not fit easily under your desk. The second is because you want to be easily able to reach all edges while stretching. There are other mats that range between 25 – 30 inches that might be more comfortable if active stretching is your main goal. The other issue is general safety issues regarding this style of mat. This is not an issue with Varidesk, more so with the style of active mat. The raised edges are a tripping hazard, and especially near a desk and computer equipment, this can be a safety concern. Lastly, many people have said that they would prefer it to be a little softer, just like the basic mat. The hardness of the mat means that you will fatigue faster an not be able to stand for as long periods. Whether you choose an ActiveMat over a basic flat mat is personal preference. We at Painless Movement prefer the active mat style due to our love of active lifestyles in general. There are concerns about safety, although this isn’t a large drawback for us. The main drawback is the size, as we believe you can get the same result from a smaller product. We do love the fact that the “activeness” level of the mat is more optional than other products. Sometimes you just don’t feel like stretching, so the larger surface area, although a drawback for other reasons, give you more room for static standing. The next style of ActiveMat from Varidesk is the Groove. The grove is like the basic mat with a twist. It is flat with a groove running from top to bottom down the middle. The groove is designed to hold a massage ball or lacrosse ball and used to massage your feet and activate your legs while standing. Straight away we like the idea of a more dynamic standing mat. The previous product had the same idea behind it, and the Groove mat takes this a step further. We have to admit, we love the creativity. The balls are designed to be used the same way as a massage ball, and you can massage the soles of your feet. This is amazing for relieving stress and removing any aches from standing for long periods. In addition to this, Varidesk provides 3 balls of varying firmness so you can choose deep, medium, or soft massages. Although the idea is great, the execution may not be perfect. We think that the groove that the ball sits in should be deeper since a few people have commented that it can easily slip out and roll away. Then you’ll be stuck chasing your ball all over the office! Because the balls are loose, you have the aforementioned problem, as well as creating a tripping hazard in the office. Perhaps not a dealbreaker but food for thought nonetheless. 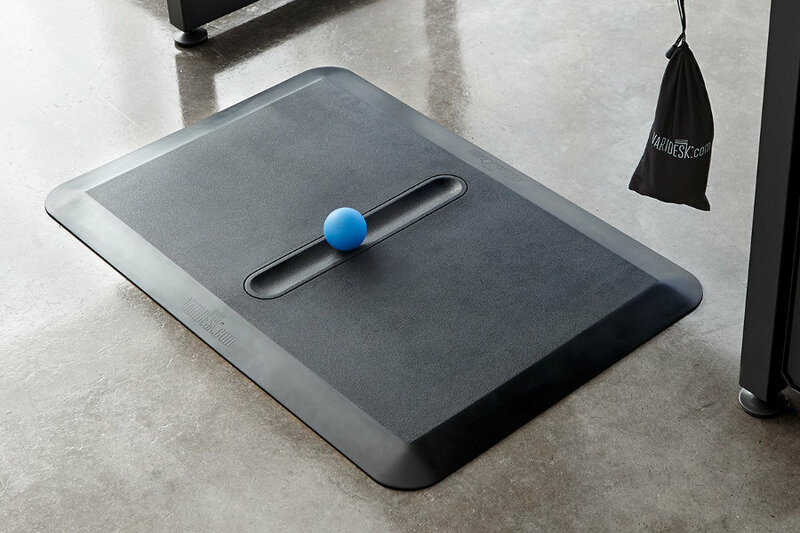 If you’re trying to get active, then the Groove mat is a fun option to use with a standing desk. We love the idea and the creativity, although there are a few issues that make it drop some points. In our opinion, you’re just as well using the ActiveMat or the ActiveMat Groove, and since they are the same price then there’s really nothing to separate them. As with many of these things, it comes down to preference. Well, if we were giving out points for creativity for the Groove, then the Rocker gets double! In terms of standing desk mats, this is about as active as they come. It is an anti-fatigue mat with a “rocking” mechanism attached to the front which allows you to place your foot in order to swing back and forward. An interesting idea and novel design, so read on to see if it is good as it seems. 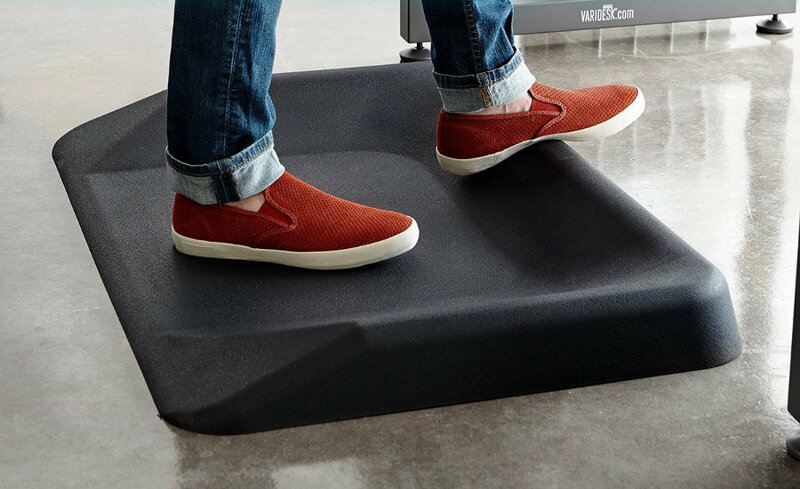 The Rocker standing mat is a clever way to get more active in the workplace. The motion of rocking your leg back and forth gives the user great mobility of their feet, knees, and hips. This sort of repetitive movement is a great way to get the blood circulating, reduce stress, and it isn’t so distracting that you can’t be productive. It comes out of the box as two pieces, the mat, and the rocker. We think this is beneficial to most users as it is pretty bulky, so if for a moment you just want to stand statically you can remove and store the large rocker section. Like the other mats, it has the classic beveled edges to make it sit flatter on the floor and be less of a tripping hazard. It also is unlikely to slip due to the material used. Interestingly, it is not as wide as the other mats (which we 36″ wide), the Rocker is just under 29″ (although 35″ deep). Some people had an issue with the width of the other products, and it seems like the Rocker is closer to a small-average size mat. Despite the reduced width of the mat, it is still rather bulky. It weighs 28 lbs and is 15.8 inches tall at its highest point. There are many people who don’t want, or can’t fit, such a large item under their desk. At that weight as well, it would b more of a nuisance to move if you often go from a seated position to standing during the day. Some people also complain that it is not as effective it looks. The bar doesn’t give you the right amount of activity and the product is a little gimmicky overall. The Rocker is a large and novel standing mat. It is a good option if you are wanting to get active, and we like the fact that it is all connected (unlike the Groove where the balls are loose). It does have the option to remove the rocking section if ever you just want to stand still on the anti-fatigue mat, so it is a versatile product. We think that if you are a die-hard standing desk user and you never sit down at work, then this product would be a good addition to your workstation. However, if you are some that regularly switches from switching to standing throughout the day, the size and weight of this product aren’t ideal for constantly moving. Monitor arms are great for additional ergonomics, allowing you to adjust your monitor to many positions. Whether you sit or stand, monitor stands help create an ergonomic office and better posture. There are many styles of monitor arm so if you’re not sure what style you need, take a look at our guide to the buying the best monitor arm. We are going to look at the Varidesk monitor arms together. Although these are two separate products, they are very similar in design the only difference being the number of monitors you can display. The best thing about monitor arms, in general, is their ability to add extra ergonomic adjustability to your working setup. If you have a standing desk or a desk converter, but you’re still not quite comfortable with your posture, chances are the monitor positioning is to blame. Varidesk has single arm and dual arm monitor mounts to solve this issue. Additionally, a monitor arm will create additional space on your desk by removing the monitor bases. The Varidesk is easy to install and VESA compatible, so you can be up and running in just a few minutes. All the required tools come with the product and you can use the small Allen key provided to tighten or loosen all the articulations to your liking. 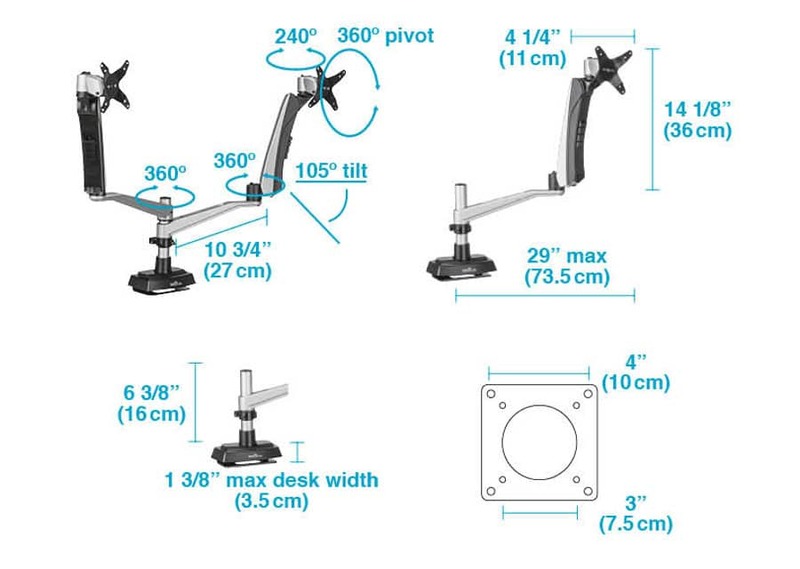 With both the single and dual arms, there are 3 main articulations: the base pole, which the arm can rotate 360 degrees on, the second articulation which has 360 degrees rotation plus 105 degrees tilt, and the last articulation where you attach the monitor has 240 degrees rotation and 360 degrees pivot of the screen. Each arm has 20 lbs of weight capacity, more than enough for most monitor sizes, plus it has 29 inches of arm extension. We love the level of movement capable with the Varidesk monitor arm, so in this department, it scores top marks. The major complaint that the Varidesk monitor arms receive is their lack of compatibility with other desks. All Varidesk standing desk products have monitor surfaces of the same width, and the monitor arm is designed to fit perfectly with Varidesk desks. On their website, they say that the monitor arm is compatible with other desks only if the desk is 1 3/8 inches thick. 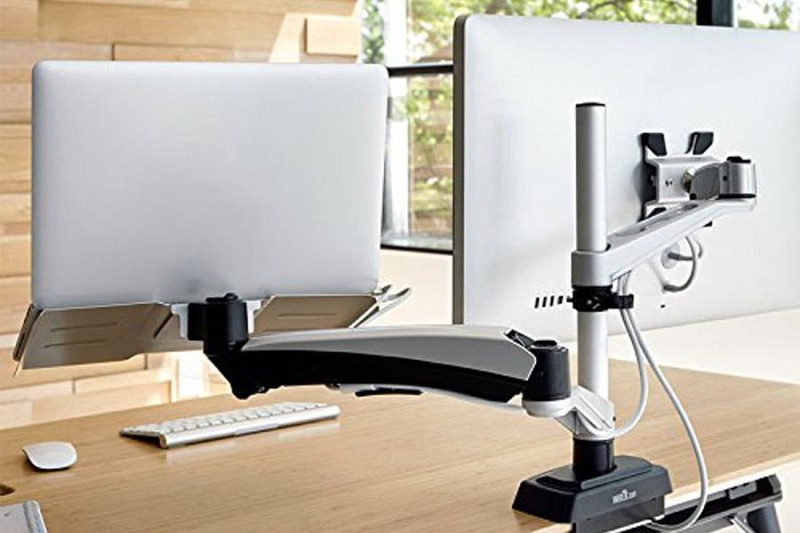 If you have a Varidesk standing desk or standing desk converter, then a monitor arm from Varidesk is a fantastic addition. We love how easy it is to set up, the amount of articulation possible, and its compatibility with most monitor types and sizes. If you don’t have a Varidesk, consider looking for a monitor arm that is compatible with your desk width. All in all, we like the Varidesk monitor arms. To get a better look at how the work, check out the video above. If you often work from a laptop, you’ll understand the pain it is to always be looking down at your desk to see the screen. A standing desk or converter can give you a little extra height, but if you need your laptop screen as well as a monitor its much better to have them at the same height. The other monitor arms can support up to 20 lbs of weight, whereas this product can support an additional 10 lbs. If you use a large monitor then this extra 10 lbs should have you covered. 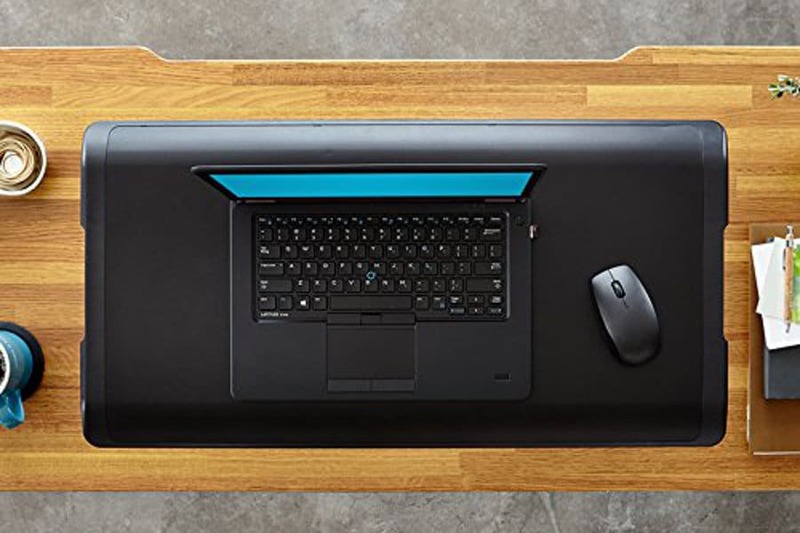 Laptop use with a standing desk can be difficult, so with this product, you can have the laptop up closer to eye-level (it has a 12″ adjustment range). The cradle has a decent amount of maneuverability and can be adjusted to lift or rotate, but not tilt. We have a few issues regarding the adjustability of the monitor mount. Unlike the other monitor mounts, this one only has 2 articulations. It can rotate around the base pole 360 degrees, and the monitor itself can spin 360 degrees on the arm, however, it lacks vertical adjustability. To adjust the vertical height of the monitor, you have to loosen a screw on the mounting pole, slide the arm to the correct height, then re-tighten the screw. If you are never planning on adjusting the height of your monitor, for example, someone who only stands while working, this should be ok. This is not great though for people who move between sitting and standing. Lastly, you are limited to a small-to-average size laptop on the tray. Most laptops are around this size so it shouldn’t be an issue, but if you use a larger gaming-type laptop, the cradle will be too small. Not our favorite of the monitor arms. If you use a laptop and require two screens, we think you are better off getting two monitors and using the dual monitor arm. The lack of adjustability with this product makes it more of a burden at times, and less favorable than the previous models. The redeeming factor of this product is the fact it can hold more weight. Due to only having 2 articulations rather than 3, it can hold a monitor that is 10 lbs heavier which may favor some users. Last but certainly not least, we have the Varidesk office chair range. The range is, in fact, two chairs, the VariChair, and the much more recent VariChair Pro. We have again decided to review these as a single product as there are only minor differences between them. To start with, we’ll point out the differences between the two products. Both seats have the same design and adjustable range, although the VariChair Pro has a larger seat base. The padded seat of the Pro is 17.5″ x 14″ and can support 250 lbs, whereas the VariChair is only 13.75″ x 14″, supporting 220 lbs. These chairs are designed to create a form of active sitting by having a dynamic range of movement, both for full seated work and standing desks. These chairs will engage your legs, core, and back muscles as you can move through a wide range of back-and-forth and lateral motion. They both use a sturdy weighted base plate, so there is no chance of the chair sliding out from underneath you. Another great feature is the 10-inch adjustable range. At their lowest, the chairs are 23″ tall, and can be lifted to 32.75″. This provides a great solution for leaning at work. 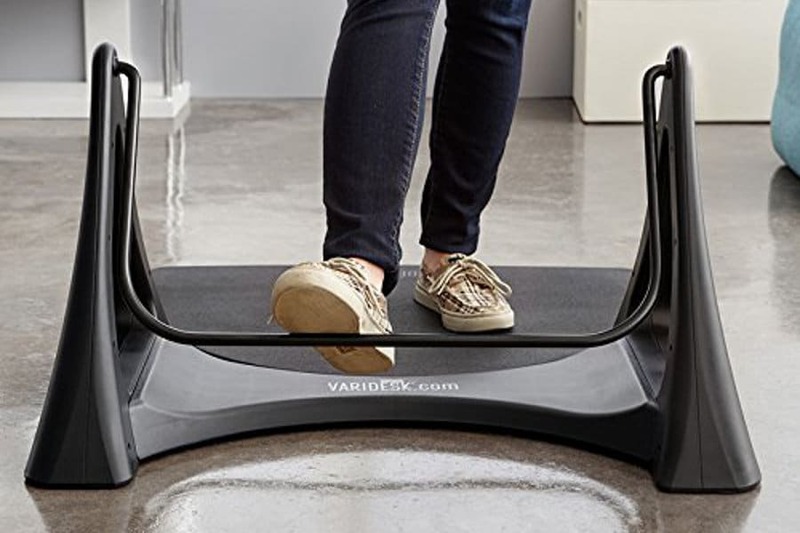 If you are standing desk user who doesn’t want to sit down completely, but occasionally wants a break from standing, the VariChair, and the VariChair Pro allow you to perch while working. The lifting motion is supported by an air-lift piston mechanism, making it very easy to raise and lower. The major complaints of the VariChair models come in three departments: wearability, comfort, and size. A few users have noted that due to the movement of the pole around the base plate, the two pieces have come apart or the rubber around the base plate has cracked. This seems like a materials issue or maybe that the range of motion is too great. In saying this, VariDesk has a great warranty policy so if there are issues with your product they can replace it. The most prominent issue we discovered is concerning the comfort of the seats. The are some complaints of the cushion being too hard and that sitting for long periods is not possible. There is also a relevant point concerning the chair’s use. It is an active chair, and you won’t really be able to fully disengage while using it. For first time users, this can be quite a shock and long periods on the chair can be tiring. Lastly, despite being an adjustable chair, there are issues with the maximum height. If you are over 6 ft tall then this chair might be a little small to perch comfortably. Some users have noted that the chair can be placed on blocks or on a small platform to overcome this issue. Active sitting is a great way to engage your core muscles and legs while working. We like these products and think the idea behind them is fantastic. We like the fact that recently added the VariChair Pro to their list of products, as the larger seat is not only more comfortable but allows for a wider demographic of users since its supports 30 lbs more. Although there are concerns about the longevity of the product, if you check Varidesk’s warranty terms then you can feel comfortable knowing they will replace faulty items. A word of warning, however, it seems that active sitting isn’t all that easy, so start slow with the chair and build up to longer seated times. If you are sitting incorrectly due to fatigue then you may be doing more harm than good. However, if you want to build core strength then this product will get you active and engaged throughout the day. So we’ve looked at and reviewed 21 Varidesk products, and given what we believe to be very unbiased details on the products. We compiled hundreds of reviews, specs, opinions and more to provide you a comprehensive overview of each Varidesk product. Now to sum up, we’ll take a look at Varidesk as a company, using the following four categories. It’s clear to see that in terms of product quality, Varidesk is considered one of the best. They use high-quality building materials and have had many years honing the design and functionality of their ranges. There are a couple of design issues when it comes to levers being too close to the keyboard tray, but the overall consensus is that the products deliver when it comes to quality. 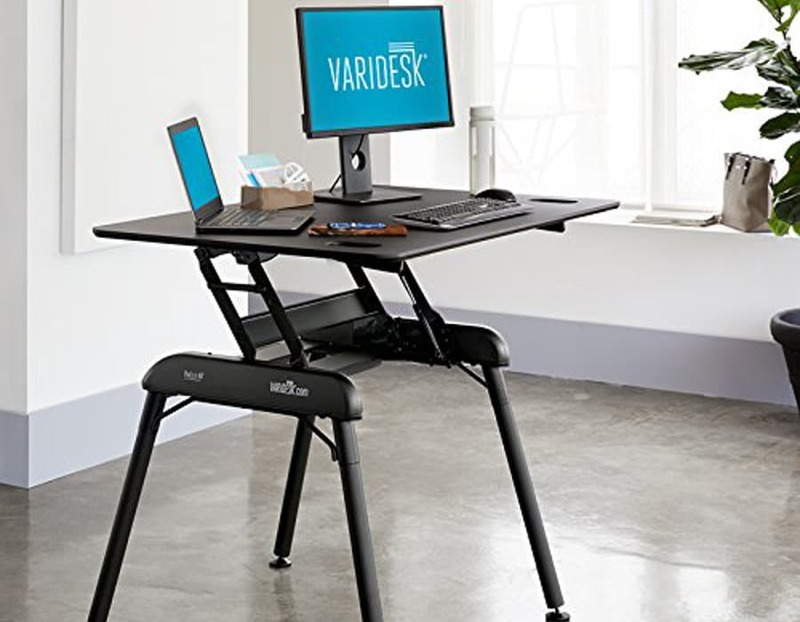 Varidesk was the first company to really design and develop quality products in the standing desk industry. They were the first on the scene, and the price reflected their expertise and quality. The industry has since boomed and there are a number of competitors on the market. This brings new designs, new products, and cheaper prices. Compared to its competitors, Varidesk is what we would consider a mid-range price point. They are not the cheapest nor the most expensive. You can get many of the Varidesk products cheaper, but Varidesk certainly does deliver in the next two categories. After countless hours of research and scouring the web, we couldn’t find any bad things said about Varidesk. There were many negative reviews from people regarding certain products, but not once do people complain about the service provided by Varidesk. This is a real testament to the company, and you know that when you purchase one of their products that you’ll be in safe hands. Not only that, according to GlassDoor it seems like a pretty nice place to work. Varidesk offers a very good deal when it comes to warranty and returns. 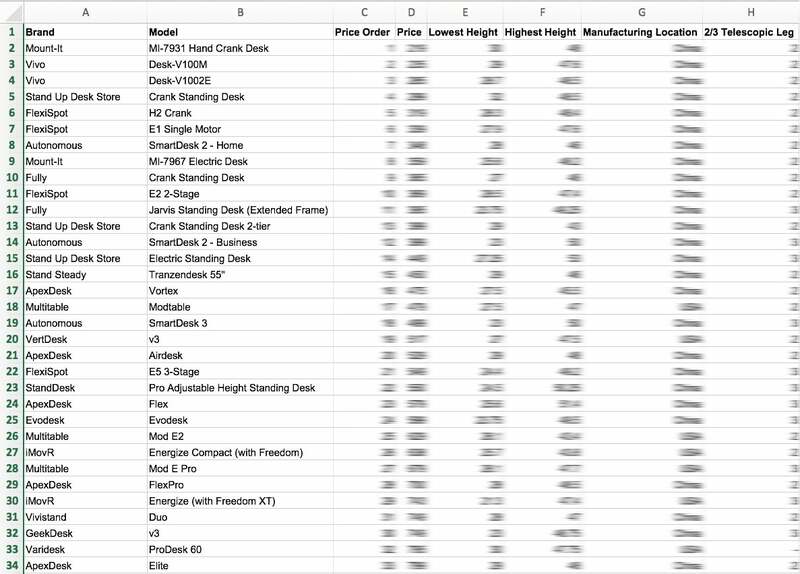 You can see the full breakdown on their website, but essentially there is 1-year on all smaller products, 5 years on all surfaces, hardware, mechanical parts, motors and monitor arms, and 10 years on the QuickPro series. Although the warranty isn’t the best available, the 30-day money back guarantee certainly is. If you are not satisfied you can send your Varidesk product back to them absolutely free (they provide a no-cost curbside pick up) and you will receive a full refund within just a few days of them receiving the product back! Although the customer service and warranty factors rated so highly, we put a strong weighting on the price and quality of the products. Varidesk overall offers great value and products you can trust. The price point is higher than a lot of the newer competition, but for the price, you do receive peace of mind knowing that if the product is not to your liking you can return it free within 30 days. We wouldn’t go as far to say Varidesk is the best standing desk company on the market, but we do rate them highly among their peers. This was our first in-depth company review, so we’ll be seeing soon how Varidesk truly rates against the other companies.